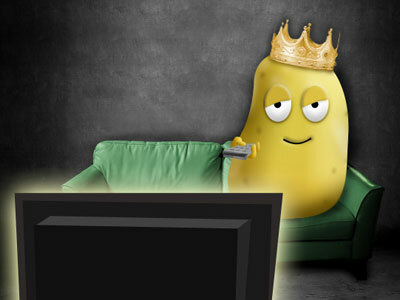 Man is the Ultimate Couch Potato! Just ask the 26-year old Jorge Cruz, a Washington Heights local who recently joined and won the third annual Ultimate Couch Potato Competition after sitting for 26 hours straight. Yes, it’s a competition and yes, it’s already on its third year. What? Where? How? What the hell?! The unbelievable competition is annually held at New York’s Time Square on a sports bar called the ESPN Zone. The sofa smackdown, as many would call it, only requires you to sit on a couch while being bombarded with snacks and live sports telecasts. According to nydailynews.com, Jorge Cruz outlasted three other couch potatoes for a record holding 26 hours of non-stop sitting and munching. The previous year’s winning record was 19 “grueling” hours. The lucky foursome took their spots on New Year’s Day, ready to watch a big wall full of TV screens featuring sports shows. They were allowed to have hourly stretch breaks and bathroom visits every 8 hours just to keep things interesting – and less nasty. In the end Cruz won cash vouchers, a year’s worth of cable subscription, and a trophy topped with a real potato. The competition though, isn’t as easy at it sounds, if you can believe it. He recalls having to research the sport of competitive sitting to prepare for the contest – which includes having to avoid caffeine and water as much as possible. While a contest like this won’t likely grace our very own sports bars, rest assure that we are doing our very best to make an event as legendary as this one happen here. But we prefer to sit it out for now. Let’s rejoice for the meantime and thank heavens such thing exists!